Are You In A Hurry? Here's A Summary Of The Campbell Hausfeld Air Compressor Review. 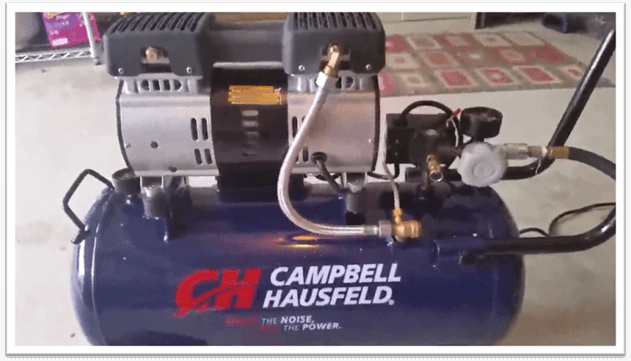 This Campbell Hausfeld air compressor is 50% quieter than traditional air compressors since it comes with pre-installed twin mufflers to deaden the sound. Model DC040500 comes with 4.6 Gallon compressed air storage capacity and is ideal for short, but intense applications at 110 PSI. 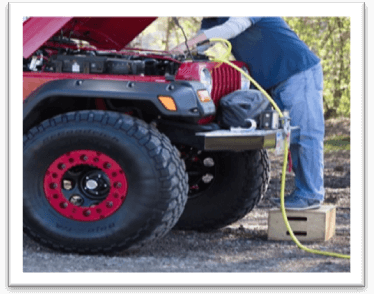 This air compressor is featured with rubber padded feet for extra solid grip on rough, or slippery terrain and a commercial performance level at an affordable pricing fork. Among the few air compressors, I have tried to date, the Campbell Hausfeld air compressor model: DC040500 is a much more favored product on my radar. By capacity, the aforementioned model holds approx. 4.4 Gallons of super compressed air, but if that limit is too low for you, you can sift through the company’s other products. Campbell Hausfeld offers alternative models of the Quiet Air Compressor DC040500 series with air holding capacity ranging from a minimum of 1.3 Gallons and up to a maximum of 8 Gallons. This feature alone is a big plus one for veteran air compressor users out there, but what about first timers who have never purchased a compressor before? What About the Air Compressor Accessories? Conclusion On The Campbell Hausfeld Air Compressor? This Campbell Hausfeld DC040500 review is not only written with the intent of helping you to buy a decent product, but also gain some useful insight on what exactly makes product: A better from product: B. There are many factors in this context. For instance, you might be lured in to buying an air compressor because it says “Quiet” on the packaging. While it is true that noise emission factor accounts for preselling an air compressor, you have to keep an eye out for product specification and actual on site performance. When I bought the Campbell Hausfeld DC040500 air compressor, I was not looking for higher air storage capacity. There were other features, such as the dual tank stack, and high speed air ejection that appealed to me in the first place. Campbell Hausfeld DC040500 air compressor boasts of many added benefits over conventional products in the market. For instance, it is 50% quieter than Bostitch pancake series air compressor. If you haven’t read my Bostitch compressor review, you can read it right now by scrolling through the relevant category on this website. The point is that Campbell’s simply better than the last air compressor on my list. Of course, there is the price difference because this unit is comparatively more expensive than Bostitch pancake compressor. However, the heavy ticket price makes up for it through a relay of many technical upgrades. Okay, tires aside, what else is Campbell Hausfeld DC040500 good for? I know, when it comes to air compressors, people automatically think of blowing up tires and kids’ inflatable jump castles. However, these products have a far extensive use in terms of professional application. The safety mechanism applies to the air compressor unit only. Therefore, don’t assume that there’s something in it for prevention against limb injury or vice versa. I tried this unit for a commercial run against rotary screws, and high-pressure inflation, things did not turn out well. This is the part where you can probably use the Campbell Hausfeld DC040500 air compressor with a slight degree of roughness – and that too without worrying about causing any permanent damage to the unit’s mechanism. I found out that any inflation, which required a high pressure, or high voltage level, which exceeded DC040500’s max output, caused the unit to trip. The company installed a bunch of circuit breakers that activate whenever this air compressor is being used in excess of its output capacity. 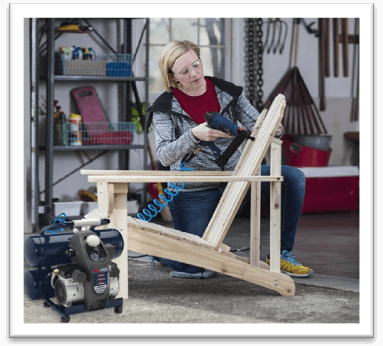 This is a nice feature, considering that many users don’t know the exact tolerance level of their air compressor – and when they over use it, the motor gets damaged, or the pump oil starts leaking. In worst-case scenario, you can also cause a minor microscopic leak to occur in the tank. Yes, you can send the air compressor back for repair, but once the tank, or the air holding part has leaked, there is no coming back from it. It’s better to discard the unit and buy a new one while you are at it. Campbell Hausfeld DC040500 air compressor decibel rating ranges between 40dB to 85dB end. Obviously, 40 is the lower number, which implies that the air compressor is quieter than a mouse. However, I cannot exactly say that this is the exact rating for Campbell Hausfeld air compressor. The company intentionally left the decibel rating at a variable point (it is 68dBA to be exact). It means that although the unit itself is quiet as compared to traditional cheap air compressors such as the Porter Cable C2002 , it is not “that” quiet. You can relentlessly blow air at a stable pressure without worrying about losing the air transmission stability. In general cases, the quieter an air compressor goes, its ability to inflate air is equally compromised. Therefore, you can expect Campbell Hausfeld’s model DC040500 to hold ground against not only basic pool tubes, but also high pressure yacht cylinders. Campbell Hausfeld DC040500 has a dedicated 1 HP. I know “1” sounds like very low, but there’s a ton of power stored up behind that single horsepower unit. Regardless, I’d advise you to look for specifications pertinent to horsepower before buying an air compressor. A lot of cheap models operate at 0.5 or 1 tenth of the actual horsepower written on the box packaging. The best way to measure an air compressor HP is by buying a gauge; they are available easily in the market. You can use the gauge to see where exactly does the HP rating stand before doling out your hard earned cash. The higher the HP is, the better is your overall performance metrics for an air compressor. However, higher horsepower air compressors also emit a lot of noise. This Campbell Hausfeld air comperessor only has 1 HP, which was done so to keep the noise emission under bearable levels, while not compromising the performance too much. 2 Horsepower motor air compressors are relatively pricier. They have a minimum tank fill up timing, but these air compressors are normally reserved for industrial use. 1 HP is ideal for home use, where you are looking for quieter inflation operation at standard 110V. As stated earlier, Campbell Hausfeld has introduced their flagship DC040500 model with several storage capacities. The one I am reviewing has a 4.4 Gallon storage limit, but it goes all the way up to 8 Gal. if you are looking to spend some extra cash. The tank size is not a sign of how quiet or noisy an air compressor is. Therefore, feel free to go for a higher storage limit if you have some demanding work to do. By the way, it takes more time for the tank to fill, and even more duration for the air to compress if the tank size is ginormous. 4 Gallons for a Campbell Hausfeld DC040500 unit is okay for residential use purposes. 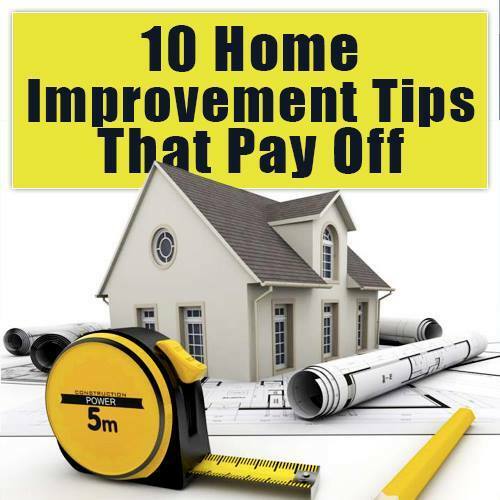 You can also get by with a ton of DIY projects if you are a private contractor, or a small scale on-site worker who doesn’t outsource his power tools too much. Right out of the box, if you have bought a unit only version of the Campbell Hausfeld DC040500 air compressor, there is not a lot to go on with. The company does offer add-on accessories, such as a 50 Ft. hose, pliers and nozzles as a bundle deal at online retailer websites, but the default package only comes with 2 air outlets and quick connect couplers. If it is your first time buying a Campbell Hausfeld air compressor, or any other tool only air compressor, you will need to buy the accessories. Think of buying accessories as a one-time expense necessary for operational purposes. I found out that the other tool only air compressors, especially pancake models, had a higher ticket price than Campbell Hausfeld DC040500. Includes pre-installed twin mufflers to deaden the sound. Campbell Hausfeld Quiet Air Compressor series is offered with multiple storage limits. Has rubber padded feet for extra solid grip on rough, or slippery terrain. 50% quieter than traditional air compressors. Yes, you can finally hear the garage door opening and closing WHILE this air compressor is filling up! No need to use ear plugs while operating Campbell Hausfeld DC040500 air compressor. Ideal for short, but intense applications at 110 PSI. 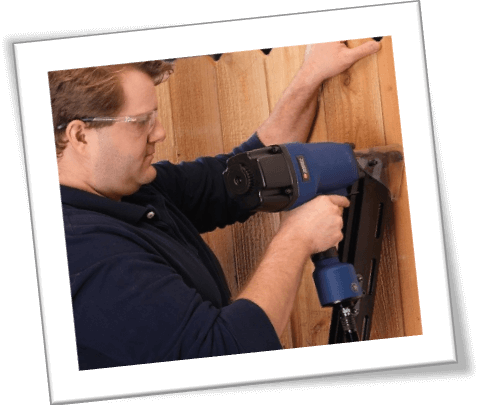 Includes built in circuit breakers to avoid damage to the internal mechanism. Weighs 38 Lbs. It is not exactly a lightweight profile air compressor. Only supports 120V power rating. If you are an international customer, don’t forget to order a step up/ step-down transformer from the local electronics shop before using this air compressor. Does not include any accessories with “tool only” order. If you are not heavily relying on professional applications, then a Campbell Hausfeld air compressor might just be the right product for you. At 1 HP and ridiculously low noise levels, I can safely say that all of my general purpose usage, such as, but not limited to air inflation, sealant application and nailing were done without a hitch. This isn’t a lightweight unit, but you will get used to lobbing it around in a week or two. Feel free to reach out to other air compressor users at various online forums or read our in depth air compressor comparison review. They will fill you in on a lot of tips to help your first time experience something worth remembering in years to come.